Is there any prospect of an end to the deterioration of relations between the EU and Russia? Irina Busygina explains that Vladimir Putin’s strategy for maintaining domestic support has focused on the construction of external threats and the promotion of an image of ‘Russian greatness’ on the international stage. But by putting foreign policy in the service of domestic goals, Putin has created a situation where he can’t make any concessions to Europe, and where European concessions to Russia are useless. In a previous article on this site in 2016, I wrote that that both the European Union and Russia had few incentives to normalise their relations. Since then, the political relationship has deteriorated significantly. Europe is learning how to talk to Russia on the “language of coercion”. The recent manifestations of this include expelling Russian diplomats from Europe in response to the Salisbury attack (and Russia’s “mirror measures”). There is also a new level of financial scrutiny against “suspiciously wealthy” Russians in London, and accusations against Russia of blocking the access of experts from the Organization for the Prohibition of Chemical Weapons to the site of the alleged chemical attack in the Syrian city of Douma. It can be argued that there are now no incentives for improving the relationship, but strong incentives for further deterioration, at least from the Russian side. As Russian Foreign Minister Sergei Lavrov said in an interview with the BBC, relations between Russia and the West are worse now than in the days of the Cold War, because in those days there were channels of communication and there was no obsession with Russophobia, which looks like genocide through sanctions. With the first part of this phrase one can fully agree. Some call this situation a “new normal”, however, “normality”, whether old or new, still applies to a stable situation, to the status quo, that is definitively not the case at the moment. Where the “bottom point” of the EU-Russia relationship lies, is not yet clear. Meanwhile, it is important not to confuse the various manifestations of the deterioration of EU-Russia relations with the main reason for the deterioration. I argue that this deep reason is not that the “world of democracies” meets an increasingly consolidated autocracy: as previous practice shows, democracies and autocracies are capable of peaceful interaction. The reason lies in the specific relations that bind Russian foreign and domestic policy, and this fundamentally differentiates the situation in Russia and Europe. In the EU and European countries, members and non-members of the Union, foreign policy is an autonomous policy sphere, although strategically connected with domestic policy. Of course, foreign policy moves can be successful and less successful, and the meaning and timeliness of these moves can raise questions. For instance, a reasonable question in relation to the crackdown that British Prime Minister Theresa May has vowed on “serious criminals and corrupt elites” from Russia who have settled in London might be: why was it only announced now? The situation was widely known about for a long time and repeatedly discussed in mass media, both Western and Russian, but until recently this didn’t cause a reaction (at least, embodied in the actions) in British state institutions. With regard to the EU’s foreign policy, the difficulties of reaching a common position are obvious. For many years, Russia has been a “dividing issue” inside the EU: not all member-states agree with Brussels’ current level of disengagement with Moscow, and – at least in part – this is due to different levels of dependency on Russia for some member states in contrast to others. However, what is important is that the foreign policy of the EU and European countries remains “foreign”: it is facing the outside world and is motivated by external challenges and goals. The situation in Russia is fundamentally different. Under the conditions in Russia, where there has been no succession of power and the incumbent has remained in the presidential office for eighteen years, domestic popular support is the most important and indispensable pillar of Putin’s rule, and this – with the obligatory condition of the primacy of the Russian state – has to be preserved at all costs. That is why the presidential elections of 18 March in Russia were a culmination of unprecedented struggle, even beyond the bounds of decency, not for Putin’s victory (the victory itself and Putin’s huge break from the other candidates were obvious), but for the election turnout as evidence of Putin’s high legitimacy. And Putin confidently won the elections with 76% of the vote and a turnout of 67%. To maintain this popular support, foreign policy has arguably become the most powerful of all domestic policy tools for Putin. It is a complex tool, consisting of various elements that need to work in combination – which in turn means that the failure of just one element can ruin the system as a whole. Among these elements are Russia’s military actions, both near its borders and far away from them; the ‘philosophical’ interpretation of global trends and Russia’s role in the world; and massive propaganda concerning Russia’s external successes, intended for a domestic audience. And to consolidate this support, the idea of a threat to Russia from the West is being designed and widely propagated. In addition, another strategy for consolidating support has been to revive the idea of Russia’s greatness: an idea that is “worthy of the country’s great past” (a less ambitious project Putin can’t offer, as the Russian audience, excited by propaganda for several years now, “will not buy” the project of a “normal, ordinary country of Russia”). Finally, Putin’s project contains a considerable sovereignist component, meaning the appeal to the international system where the states (great powers, but not smaller states) guided by “national interests” maintain sovereign control over their institutions, and the terms of its international interactions. In this picture, global market forces are perceived as “unfair” and therefore, should be reduced or opposed. All in all, Putin’s tools for maintaining the highest level of domestic support possible are the construction of external threats and the promotion of the idea of Russia’s greatness with an essential sovereignist component. All this should unite the people of Russia on a patriotic basis. The flipside of manufacturing a virtual external threat is the emergence of a real threat of political and economic isolation for the country as the price of national consolidation and preserving popular support – this price, however, is obviously not too high for Putin, at least for now. 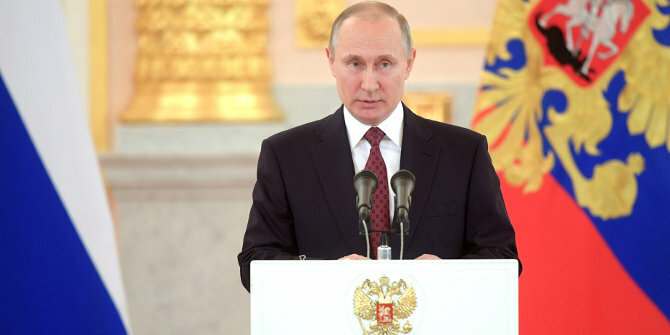 On 1 March, in a message to the Federal Assembly, he revealed his plans for the next six years – chiefly the restoration of Russia as a military superpower. The deputies gave him a standing ovation, and two weeks later the people did the same thing, enthusiastically supporting him and his “great ideas”. What follows from this logic is that the Russian leadership does not aim to start an open conflict: Moscow’s threats are more a by-product of its strategy for achieving domestic mobilisation and the preservation of popular loyalty to the regime (though fatal mistakes that could lead to an open conflict are not excluded). However, this logic implies two more conclusions. By putting foreign policy in the service of domestic goals, Putin has created a situation where he can’t make any concessions to Europe (even in the unlikely case that he would want to do that). From the other side, this situation makes European concessions to Putin useless. Europe is talking to Putin, albeit in the language of coercion. Answering her, Putin talks with his folks. Irina Busygina is Professor of Comparative Politics at the National Research University “Higher School of Economics” in Saint Petersburg. The article contradicts itself. The main point seems to be that Russia’s foreign policy is dictated by the need to keep the electorate happy (is it really bad? if it is true, why does the author call Russia an autocracy? ), while the EU’s policy is carefully weighted and deliberate. If the latter is true, then the EU seems to be deliberately trying to worsen the relations with Russia – after all, all adversarial actions in the bilateral relations so far were initiated by the EU, not Russia. And if EU is indeed worsening the relations deliberately, then the siege mentality of the Russian government is, perhaps, simply an acknowledgement of the reality?